An avenue of honour commemorates those who served in World War One. New trees have been planted at the site. 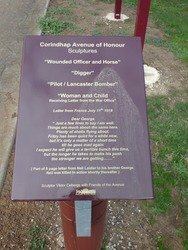 The Avenue of Honour also consists of carved wooden sculptures which show a "Wounded Officer and Horse", "Digger", "Pilot / Lancaster Bomber", and "Woman and Child". The Corindhap avenue was planted with Cypress and Radiata pine trees back in 1917. Over the last few years some of these majestic trees have reached the end of their life but rather than chopping them down for firewood, the Corindhap community decided to keep the lower trunks intact and commissioned local artist Viktor Cebergs to fashion sculptures that would reflect the commemorative spirit of the site. The result is that the old trees have been transformed into sculptures depicting imagery of war. 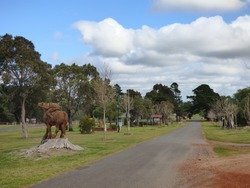 The Corindhap Avenue of Honour, located on Colac-Ballarat Road, was planted to commemorate those who served in the First World War. 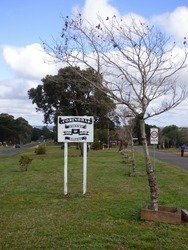 The avenue was planted on the 15th September 1917 as a mark of admiration for the men of Corindhap who had left to fight in the Great War. The Ballarat Courier, 19th September 1917.